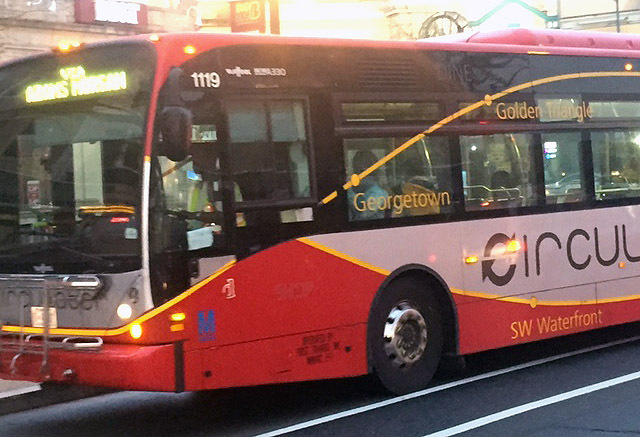 DC Circulator bus drivers say that safety problems uncovered during an audit last August continue but the transit service's private operator says that many of the problems have been addressed and they haven taken steps to correct the problems uncovered. WASHINGTON — DC Circulator bus drivers fear that major safety problems with the red and yellow buses could lead to a crash or injury even months after a scathing audit obtained by WTOP showed major problems with the privately-run bus system. First Transit, the private company that operates the Circulator buses for the District, released a statement Friday saying that it was disappointed with the results of the August audit, which found all but two of the buses inspected should have been pulled from service. Since then, First Transit said it has brought in new management and that safety conditions have improved. “A second audit was conducted in January of 2016 that showed significant improvement. There was a 77 percent decrease in the total number of reported defects,” the statement said. However, First Transit was not specific about how many of the remaining defects are considered the most serious. And the company said that 18 brand new buses have joined the fleet since August. But the union representing Circulator drivers says its own, informal safety survey last month still found a number of issues with the buses that would have required them to be pulled from service if the bus were a public transit vehicle like Metrobus. The safety issues found in the August audit included brake problems, cracked windshields, or other issues that could have led to a crash. In some cases, bus doors were hanging open putting passengers at risk for falling out of the bus. D.C. Council member Mary Cheh, who chairs the transportation committee, says she is appalled that the audit was not released to the council when it was conducted, especially given the findings that the buses were dirty and dangerous. Separately, the union is asking for higher wages for drivers to match those paid to Metrobus operators as part of ongoing contract negotiations.